We’ve all heard the statistics before. 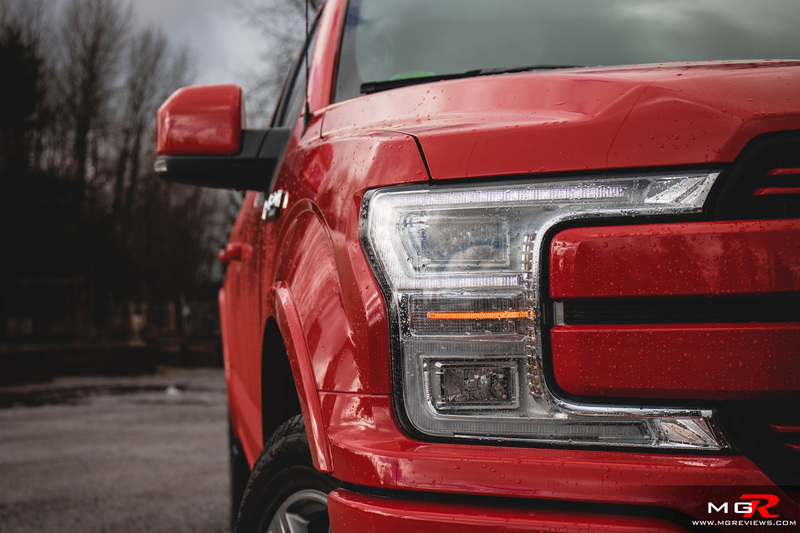 “The Ford F-150 is the best selling vehicle of all time. 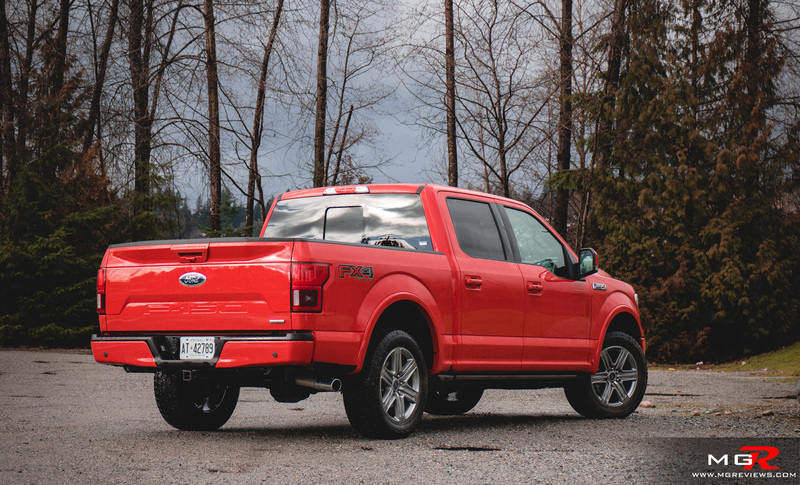 Period.” But what makes a pickup truck more appealing than a hatchback or a sedan or the latest SUV craze? Partly because pickup trucks are more customizable than supercars and also that they do literally everything. It’s like three vehicles in one. 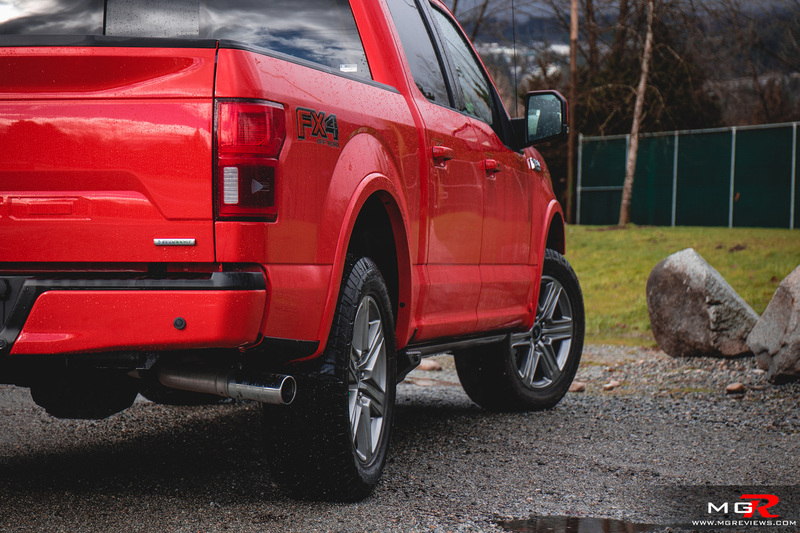 Engine – With the 2018 Ford F-150 you have 6 engines to choose from. Yes, 6. There’s the base 3.3L V6, the traditional V8, a new V6 diesel, and 3 Ecoboost V6 engines. Under the hood of this test F-150 is the 2.7L Ecoboost which will be the most common engine consumers will go for. It produces 325hp and 400 lb-ft of torque. Mated with the 10-speed automatic transmission (more on that later), the engine is always in the powerband when accelerating and that powerband is quite low. Getting up to speed requires little effort when you’re not hauling or towing anything. The engine is responsive to driver inputs but it doesn’t make the nice noise that the V8 does. Ford rates this engine at 9.0L/100km on a highway and 11.9 in a city but I really struggled to reach those numbers. Let’s just say I never went below 14L/100km on mostly city driving… and it had the 136 Liter fuel tank. Refuelling this pickup was not cheap. 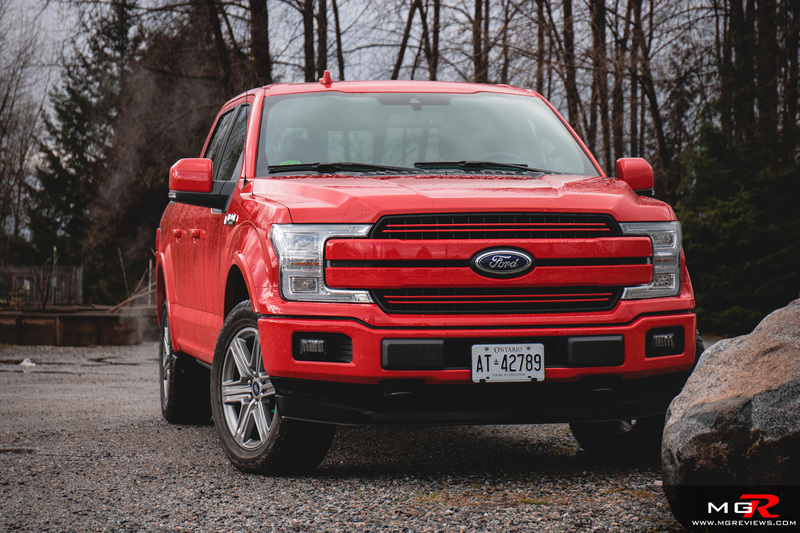 Transmission – The 10-speed automatic in this F-150 was co-developed in part with General Motors for their next generation pickup trucks and cars. Overall the new transmission in the Ford is good. At highway speeds it keeps the rpms as low as possible for the best fuel economy but when needing to overtake, it responds in a smooth and timely manner. At times it feels more like a CVT rather than a traditional automatic because the gear ratios are so close to one another. 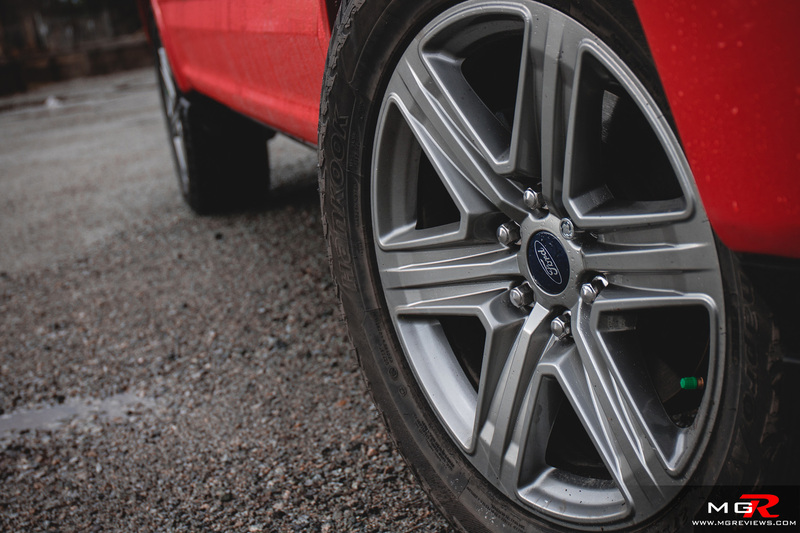 Brakes – Stopping a truck, especially when it’s carrying things or towing, is very important. 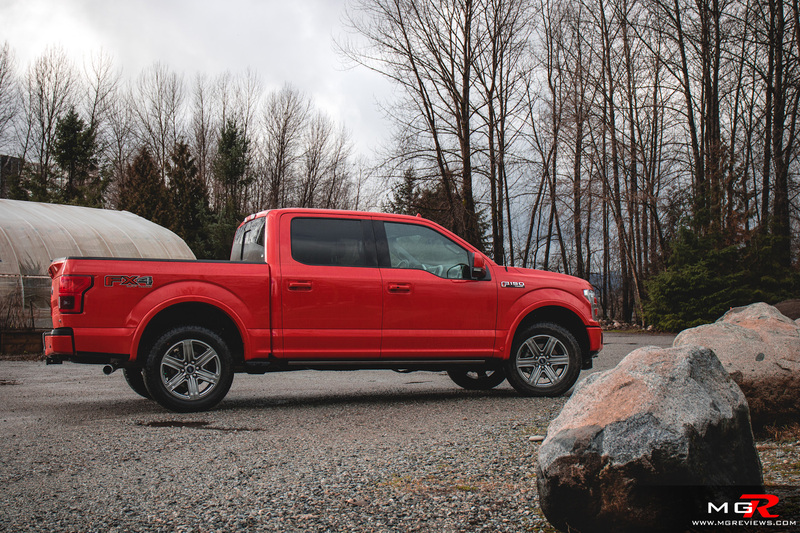 I unfortunately did not have a chance to tow or fill up the bed with junk but when the F-150 is empty (as it would most likely be most of the time), the brakes felt firm and like they could be used and abused for long periods without feeling too “mushy”. 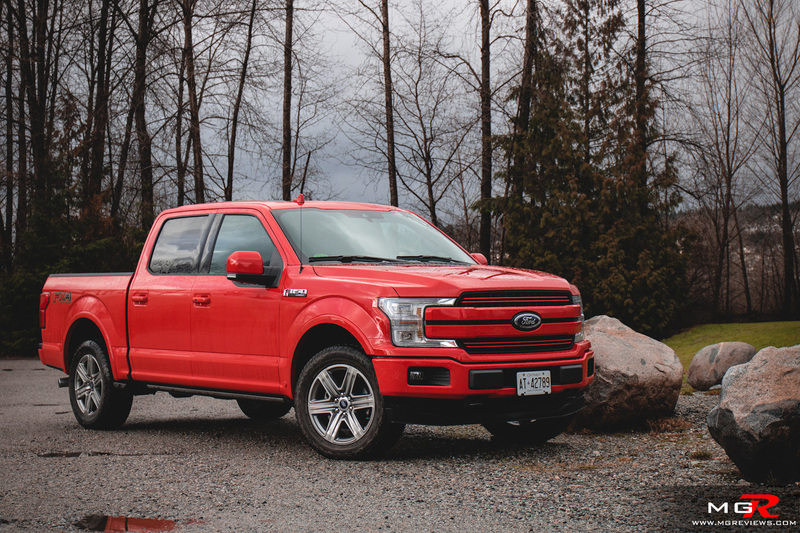 Handling – Going through corners in a pickup truck will never feel like a sports car but the F-150 manages to be composed without feeling like it’ll tip over. There isn’t a whole lot of feedback from the front wheels through the steering wheel but at least it feels like it’s connected to the wheels unlike other pickups which just feel vague. There is however a disconnected feeling when travelling at highway speeds in a straight line, almost as though the truck is floating on the road and requires constant little corrections to go in a straight line. 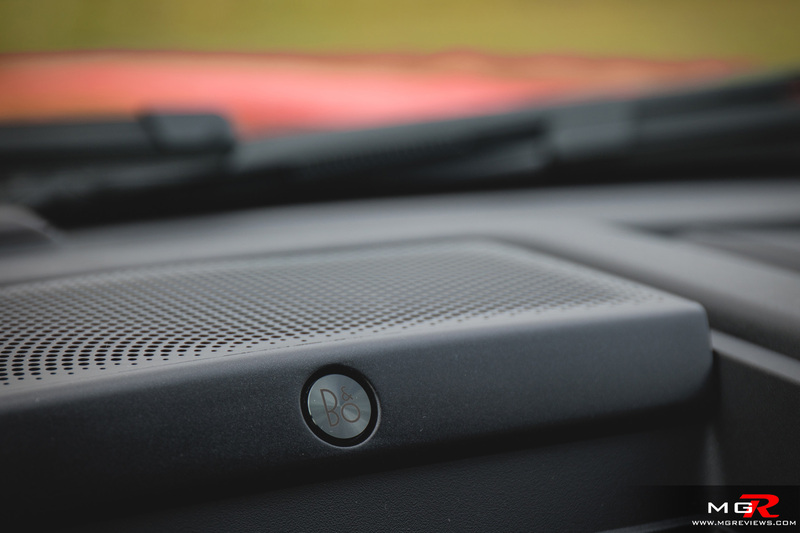 Ride Comfort – Generally pickup trucks have a harsh ride when they’re empty because the suspension was meant to cope with a loaded bed. The Ford F-150 does have a somewhat rough ride over bumpy roads but the ride is better than that of its closest competition, the GMC Sierra. This being the supercrew, the amount of space for front and rear occupants is enormous. The average height person can comfortably stretch their legs in the back seats and there is plenty of room for even taller passengers… like Shaquille O’Neal for example. 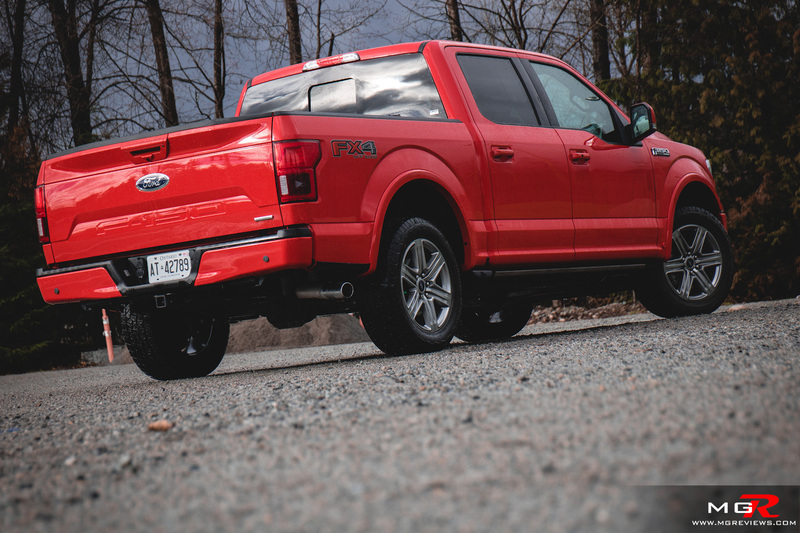 Noise, Vibration, & Harshness – Overall the F-150 is pretty quiet even at highway speeds. Only when the engine goes past 3,000 rpms does the noise start to become intrusive but under normal driving conditions the engine doesn’t need to rev that high. Over bumpy roads there are no squeaks from the trim pieces and everything in the cabin feels solid and well put together. 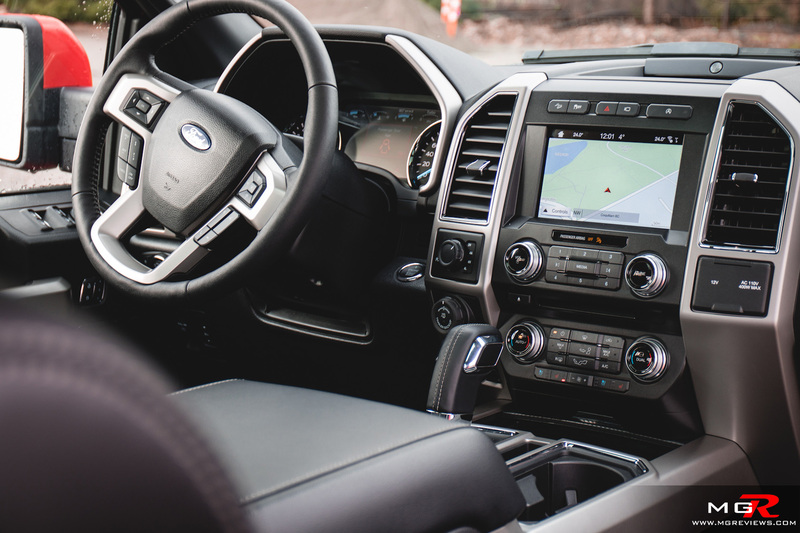 Interior Design – The F-150 may have a bit of catching up to do in the interior looks now that the 2019 Dodge Ram has been unveiled with a fresh new interior and a portrait style infotainment system. 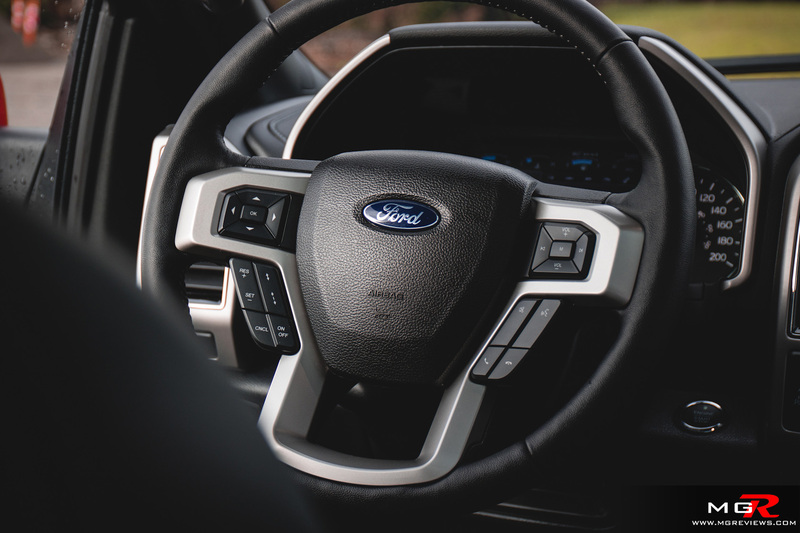 The dashboard of the F-150 is starting to show its age with the large buttons and small touchscreen. Everything works and works well but today’s consumers want the latest designs and want to be amazed & dazzled. 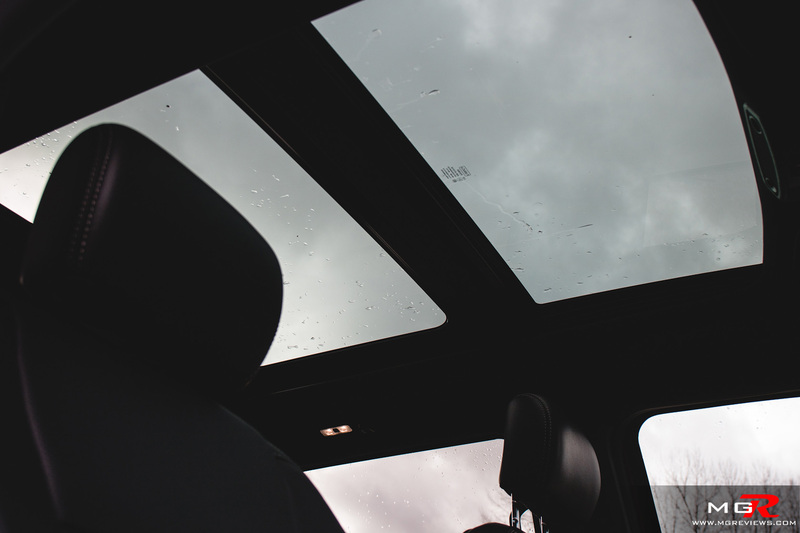 One really nice feature on the inside of the Ford F-150 is the panoramic sunroof. It makes an already big cabin feel even bigger and roomier. 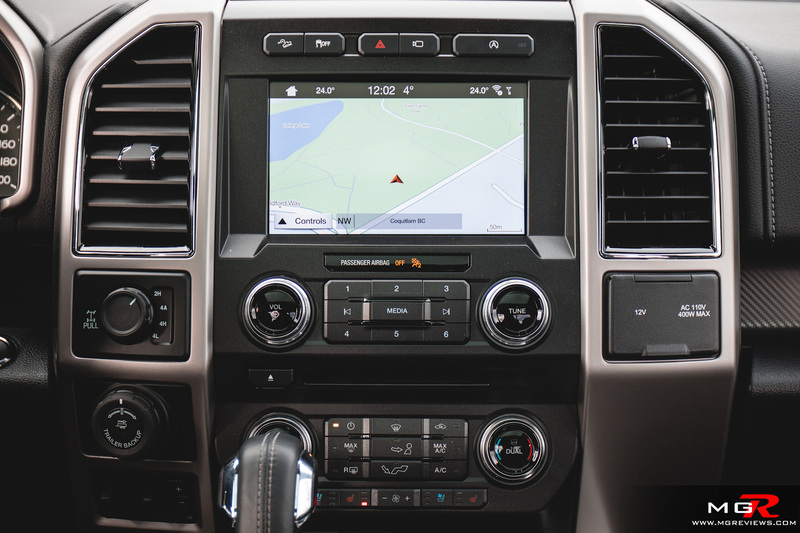 Gadgets – Starting with the infotainment system, the Ford Sync 3 system is very good. It responds quickly to touch inputs and is visually pleasing as well as easy to learn & navigate. 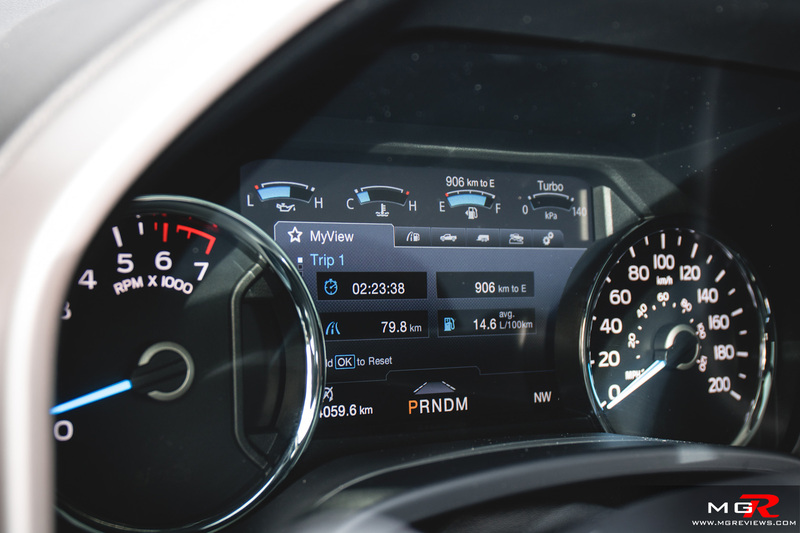 This F-150 also came equipped with the automatic emergency braking feature and adaptive cruise control with lane keeping aid. The adaptive cruise control worked fine but it was a bit too slow to react to vehicles suddenly slowing down, as in, it would not anticipate a vehicle slowing down quickly and gently braking early. It would brake very abruptly. 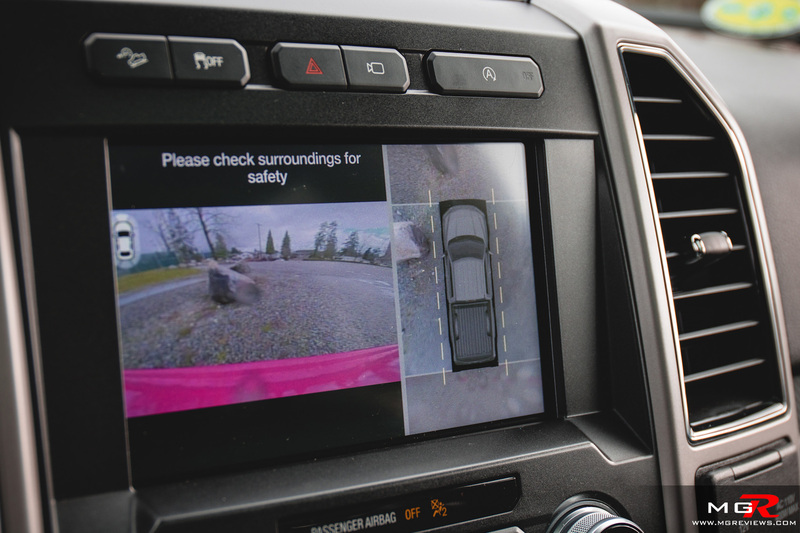 One other little niggle with the gadgets on the F-150 is the blind spot monitor. It works just fine but the warning is a small dot on the mirror that can very easily be overlooked by the driver. 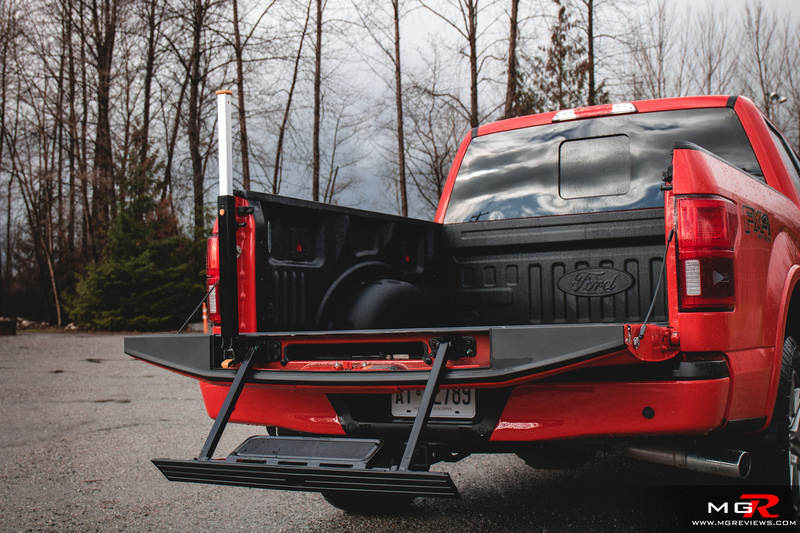 In the back there are side steps to help with getting items in and out of the side of the bed and there’s an integrated step ladder that pulls out of the tailgate. 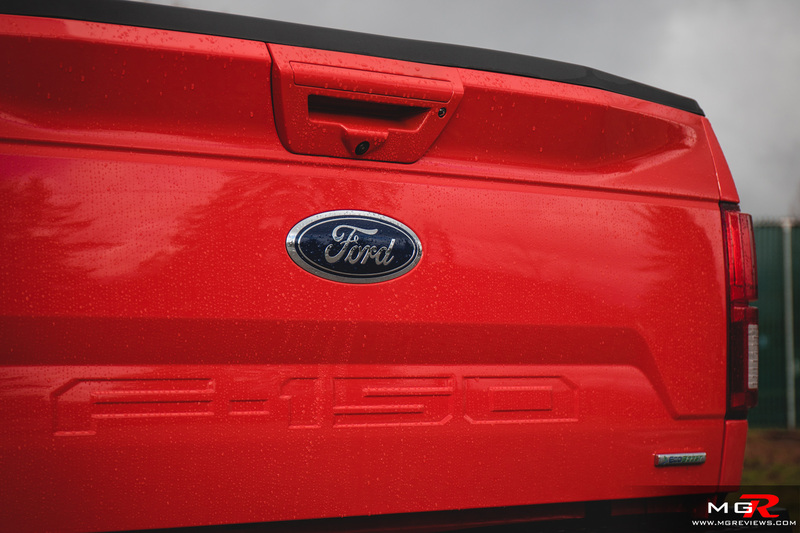 Exterior Design – The 2018 model year Ford F-150 gets a new front grille and new fog lights. The rest of the styling remains relatively unchanged. Overall it looks good and it turns a few heads especially in this red colour and painted grille. 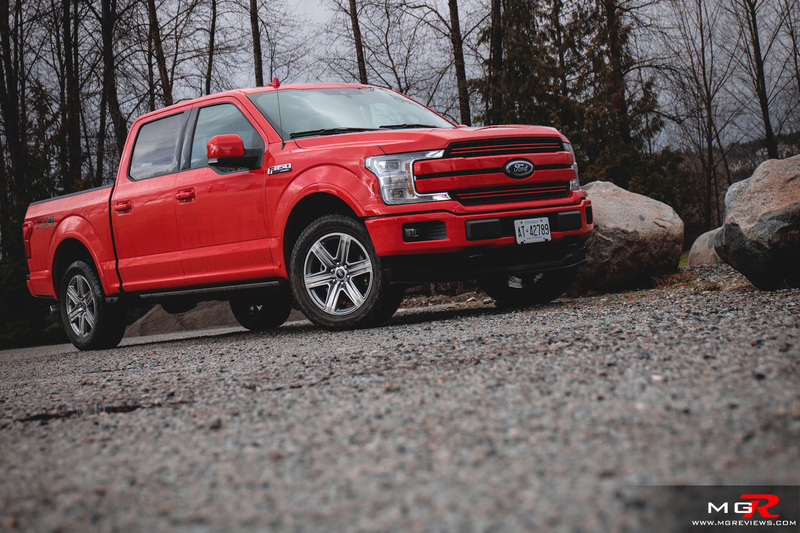 It’s easy to see why the Ford F150 is the best selling vehicle of all time. It offers many different options from engines to gadgets and everything in between. It’s also the family car, the work truck, and the suburb commuter all in one.